How important is wearing insoles in your casual, athletic, fashion and dress footwear for men women and preteens. Extremely! Sports Insoles are the most incredibly comfortable insoles for both men and women's sports and casual shoes. These specially formulated insoles are designed to make every step the most comfortable one you ever take whether you are playing golf, tennis, an avid runner or wearing them in your casual and dress shoes. Made of a soft supportive material that does not lose its cushioning, it's 3/4 length will fit in all your sports, casual and fashion footwear for preteens, men and women. One size fits all. Sports Insoles immediately improve the comfort of any shoe or shoe style. They create a soft comfortable cushioned liner between your foot and your arch support in your shoes. They reduce the friction and heat created by your feet when walking, standing or running in shoes. Many women complain of burning pain in the ball of their feet when they wear high heels. That is because the slope or pitch of the shoe is pointing downward towards the walking surface and forces the ball of your foot to the floor of the shoe. Most fashion footwear does not have adequate padding in their shoes to offset these external forces. They will also help shoes that may be a little to big for your feet and you still want to wear them without forming blisters. When using Instant Arches arch supports along with Sports Insoles your feet will experience both comfort, cushion and support with every step! Women's Sports Insoles for all sports, fashion shoes, pumps, ballet flats & casuals provides instant comfort, takes pressure off the balls of your feet all day long. Dress up or down and be comfortable. These 3/4 length tapered high fashion women's insoles are perfect for all your closed high heels, dress, casual sports and flat shoes. They reduce stress and fatigue and make your feet incredibly comfortable with every step you take. You can also make a soft supportive arch support by adding a pair of Dr. Rosenberg's Instant Arches to them. These 3/4 length tapered sports or dress insoles will make men's shoes incredibly comfortable. They are perfect for dress shoes that lack cushion and support. You will experience less stress and fatigue in your feet when standing for long periods of time on hard floor surfaces. They can also be placed on top of your current dress orthotics for more comfort. 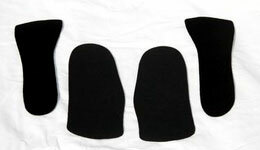 Sports Insoles are made of a soft supportive, long lasting closed cell black foam material. Because of their unique polyester hypoallergenic and antibacterial top cover every step you take is protected. Now you can walk comfortably with a spring in your step!